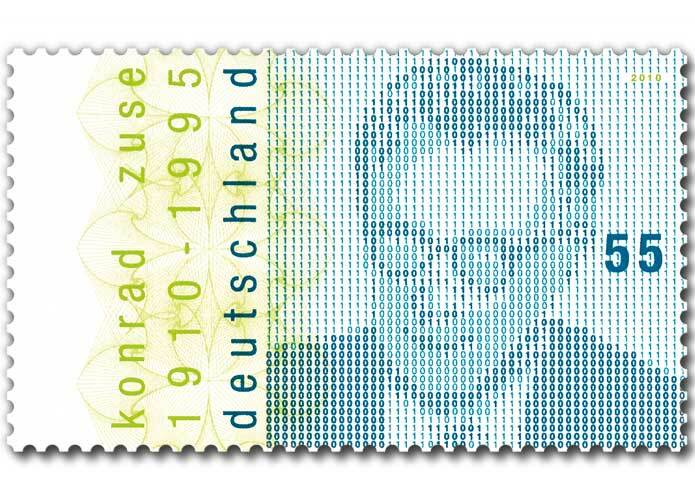 Konrad Zuse (German: [ˈkɔnʁat ˈtsuːzə]; 22 June 1910 – 18 December 1995) was a German civil engineer, inventor and computer pioneer. His greatest achievement was the world's first programmable computer; the functional program-controlled Turing-complete Z3 became operational in May 1941. Thanks to this machine and its predecessors, Zuse has often been regarded as the inventor of the modern computer. Zuse was also noted for the S2 computing machine, considered the first process control computer. He founded one of the earliest computer businesses in 1941, producing the Z4, which became the world's first commercial computer. From 1943 to 1945 he designed the first high-level programming language, Plankalkül. In 1969, Zuse suggested the concept of a computation-based universe in his book Rechnender Raum (Calculating Space). Born in Berlin, Germany, on 22 June 1910, he moved with his family in 1912 to East Prussian Braunsberg (now Braniewo in Poland), where his father was a postal clerk. Zuse attended the Collegium Hosianum in Braunsberg. In 1923, the family moved to Hoyerswerda, where he passed his Abitur in 1928, qualifying him to enter university. He enrolled in the Technische Hochschule Berlin (now Technical University of Berlin) and explored both engineering and architecture, but found them boring. Zuse then pursued civil engineering, graduating in 1935. For a time, he worked for the Ford Motor Company, using his considerable artistic skills in the design of advertisements. He started work as a design engineer at the Henschel aircraft factory in Schönefeld near Berlin. This required the performance of many routine calculations by hand, which he found mind-numbingly boring, leading him to dream of doing them by machine. Beginning in 1935 he experimented in the construction of computers in his parents' flat on Wrangelstraße 38, moving with them into their new flat on Methfesselstraße 10, the street leading up the Kreuzberg, Berlin. Working in his parents' apartment in 1936, he produced his first attempt, the Z1, a floating point binary mechanical calculator with limited programmability, reading instructions from a perforated 35 mm film. In 1937, Zuse submitted two patents that anticipated a von Neumann architecture. He finished the Z1 in 1938. The Z1 contained some 30,000 metal parts and never worked well due to insufficient mechanical precision. On 30 January 1944, the Z1 and its original blueprints were destroyed with his parents' flat and many neighbouring buildings by a British air raid in World War II. Between 1987 and 1989, Zuse recreated the Z1, suffering a heart attack midway through the project. It cost 800,000 DM, (approximately $500,000) and required four individuals (including Zuse) to assemble it. Funding for this retrocomputing project was provided by Siemens and a consortium of five companies. The Z3, the first fully operational electromechanical computer, was partially financed by German government-supported DVL, which wanted their extensive calculations automated. A request by his co-worker Helmut Schreyer—who had helped Zuse build the Z3 prototype in 1938—for government funding for an electronic successor to the Z3 was denied as "strategically unimportant". In 1937, Schreyer had advised Zuse to use vacuum tubes as switching elements; Zuse at this time considered it a crazy idea ("Schnapsidee" in his own words). Zuse's workshop on Methfesselstraße 7 (with the Z3) was destroyed in an Allied Air raid in late 1943 and the parental flat with Z1 and Z2 on 30 January the following year, whereas the successor Z4, which Zuse had begun constructing in 1942 in new premises in the Industriehof on Oranienstraße 6, remained intact. On 3 February 1945, aerial bombing caused devastating destruction in the Luisenstadt, the area around Oranienstraße, including neighbouring houses. This event effectively brought Zuse's research and development to a complete halt. The partially finished, relay-based Z4 was packed and moved from Berlin on 14 February, only arriving in Göttingen two weeks later. Work on the Z4 could not be resumed immediately in the extreme privation of post-war Germany, and it was not until 1949 that he was able to resume work on it. He showed it to the mathematician Eduard Stiefel of the Swiss Federal Institute of Technology Zurich (Eidgenössische Technische Hochschule (ETH) Zürich) who ordered one in 1950. On 8 November 1949, Zuse KG was founded. The Z4 was delivered to ETH Zurich on 12 July 1950, and proved very reliable. In 1940, the German government began funding him through the Aerodynamische Versuchsanstalt (AVA, Aerodynamic Research Institute, forerunner of the DLR), which used his work for the production of glide bombs. Zuse built the S1 and S2 computing machines, which were special purpose devices which computed aerodynamic corrections to the wings of radio-controlled flying bombs. The S2 featured an integrated analog-to-digital converter under program control, making it the first process-controlled computer. These machines contributed to the Henschel Werke Hs 293 and Hs 294 guided missiles developed by the German military between 1941 and 1945, which were the precursors to the modern cruise missile. The circuit design of the S1 was the predecessor of Zuse's Z11. Zuse believed that these machines had been captured by occupying Soviet troops in 1945. While working on his Z4 computer, Zuse realised that programming in machine code was too complicated. He started working on a PhD thesis containing groundbreaking research years ahead of its time, mainly the first high-level programming language, Plankalkül ("Plan Calculus") and, as an elaborate example program, the first real computer chess engine. After the 1945 Luisenstadt bombing, he flew from Berlin for the rural Allgäu, and, unable to do any hardware development, he continued working on the Plankalkül, eventually publishing some brief excerpts of his thesis in 1948 and 1959; the work in its entirety, however, remained unpublished until 1972. The PhD thesis was submitted at University of Augsburg, but rejected for formal reasons, because Zuse forgot to pay the 400 Mark university enrollment fee. (The rejection did not bother him.) Plankalkül slightly influenced the design of ALGOL 58 but was itself implemented only in 1975 in a dissertation by Joachim Hohmann. Heinz Rutishauser, one of the inventors of ALGOL, wrote: "The very first attempt to devise an algorithmic language was undertaken in 1948 by K. Zuse. His notation was quite general, but the proposal never attained the consideration it deserved". Further implementations followed in 1998 and then in 2000 by a team from the Free University of Berlin. Donald Knuth suggested a thought experiment: What might have happened had the bombing not taken place, and had the PhD thesis accordingly been published as planned? In addition to his computing-related work, described above, Zuse began to work in 1956 on a high precision, large format plotter. It was demonstrated at the 1961 Hanover Fair, and became well known also outside of the technical world thanks to Frieder Nake's pioneering computer art work. Other plotters designed by Zuse include the ZUSE Z90 and ZUSE Z9004. In the last years of his life, Zuse conceptualized and created a purely mechanical, extensible, modular tower automaton he named "helix tower" ("Helixturm"). The structure is based on a gear drive that employs rotary motion (e.g. provided by a crank) to assemble modular components from a storage space, elevating a tube-shaped tower; the process is reversible, and inverting the input direction will deconstruct the tower and store the components. The Deutsches Museum restored Zuse's original 1:30 functional model that can be extended to a height of 2.7 m. Zuse intended the full construction to reach a height of 120 m, and envisioned it for use with wind power generators and radio transmission installations. Konrad Zuse married Gisela Brandes in January 1945, employing a carriage, himself dressed in tailcoat and top hat and with Gisela in a wedding veil, for Zuse attached importance to a "noble ceremony". Their son Horst, the first of five children, was born in November 1945. While Zuse never became a member of the Nazi Party, he is not known to have expressed any doubts or qualms about working for the Nazi war effort. Much later, he suggested that in modern times, the best scientists and engineers usually have to choose between either doing their work for more or less questionable business and military interests in a Faustian bargain, or not pursuing their line of work at all. According to the memoirs of the German computer pioneer Heinz Billing from the Max Planck Institute for Physics, published by Genscher, Düsseldorf, there was a meeting between Alan Turing and Konrad Zuse. It took place in Göttingen in 1947. The encounter had the form of a colloquium. Participants were Womersley, Turing, Porter from England and a few German researchers like Zuse, Walther, and Billing. (For more details see Herbert Bruderer, Konrad Zuse und die Schweiz). After he retired, he focused on his hobby of painting. Zuse died on 18 December 1995 in Hünfeld, Germany (near Fulda) from heart failure. Magnetic drum storage inside a Z31 (which was first displayed in 1963). During World War 2, Zuse founded one of the earliest computer companies: the Zuse-Ingenieurbüro Hopferau. Capital was raised in 1946 through ETH Zurich and an IBM option on Zuse's patents. Zuse founded another company, Zuse KG in Haunetal-Neukirchen in 1949; in 1957 the company’s head office moved to Bad Hersfeld. The Z4 was finished and delivered to the ETH Zurich, Switzerland in September 1950. At that time, it was the only working computer in continental Europe, and the second computer in the world to be sold, beaten only by the BINAC, which never worked properly after it was delivered. Other computers, all numbered with a leading Z, up to Z43, were built by Zuse and his company. Notable are the Z11, which was sold to the optics industry and to universities, and the Z22, the first computer with a memory based on magnetic storage. By 1967, the Zuse KG had built a total of 251 computers. Owing to financial problems, the company was then sold to Siemens. An elementary process in Zuse's Calculating Space: Two digital particles A und B form a new digital particle C.
In 1967, Zuse also suggested that the universe itself is running on a cellular automaton or similar computational structure (digital physics); in 1969, he published the book Rechnender Raum (translated into English as Calculating Space). This idea has attracted a lot of attention, since there is no physical evidence against Zuse's thesis. Edward Fredkin (1980s), Jürgen Schmidhuber (1990s), and others have expanded on it. Computer History Museum Fellow Award in 1999 "for his invention of the first program-controlled, electromechanical, digital computer and the first high-level programming language, Plankalkül." The Zuse Institute Berlin is named in his honour. The Konrad Zuse Medal of the Gesellschaft für Informatik, and the Konrad Zuse Medal of the Zentralverband des Deutschen Baugewerbes (Central Association of German Construction), are both named after Zuse. The 100th anniversary of the birth of this computer pioneer was celebrated by exhibitions, lectures and workshops to remember his life and work and to bring attention to the importance of his invention to the digital age. The movie Tron: Legacy, which revolves around a world inside a computer system, features a character named Zuse, presumably in honour of Konrad Zuse. German posts DP AG issued a commemorative stamp at this occasion, June 6, 2010: a Zuse portrait, composed solely by the binary code numbers 1 and 0 in fine print. ^ Monsters & Critics Archived May 22, 2013, at the Wayback Machine: "he [Zuse] built the world's first computer in Berlin"
^ a b "Weapons Grade: How Modern Warfare Gave Birth To Our High-Tech World", David Hambling. Carroll & Graf Publishers, 2006. ISBN 0-7867-1769-6, ISBN 978-0-7867-1769-9. Retrieved March 14, 2010. ^ a b Hasso Spode, „Der Computer – eine Erfindung aus Kreuzberg, Methfesselstraße 10/Oranienstraße 6“, in: Geschichtslandschaft Berlin: Orte und Ereignisse: 5 vols., Helmut Engel, Stefi Jersch-Wenzel, Wilhelm Treue (eds. ), vol. 5: 'Kreuzberg', Berlin: Nicolai, 1994, pp. 418–429, here p. 418. ISBN 3-87584-474-2. ^ Hasso Spode, „Der Computer – eine Erfindung aus Kreuzberg, Methfesselstraße 10/Oranienstraße 6“, in: Geschichtslandschaft Berlin: Orte und Ereignisse: 5 vols., Helmut Engel, Stefi Jersch-Wenzel, Wilhelm Treue (eds. ), vol. 5: 'Kreuzberg', Berlin: Nicolai, 1994, pp. 418–429, p. 426. ISBN 3-87584-474-2. ^ "Konrad Zuse" Archived 2011-08-29 at the Wayback Machine, Gap System. Retrieved March 14, 2010. ^ Hasso Spode, „Der Computer – eine Erfindung aus Kreuzberg, Methfesselstraße 10/Oranienstraße 6“, in: Geschichtslandschaft Berlin: Orte und Ereignisse: 5 vols., Helmut Engel, Stefi Jersch-Wenzel, Wilhelm Treue (eds. ), vol. 5: 'Kreuzberg', Berlin: Nicolai, 1994, pp. 418–429, p. 424. ISBN 3-87584-474-2. ^ Lippe, Wolfram-M. "Kapitel 14: Die ersten programmierbaren Rechner" [Chapter 14: The First Programmable Computer]. Die Geschichte der Rechenautomaten [The History of Computing Machines]. Archived from the original (PDF) on 2008-05-03. Retrieved 2010-06-21. ^ a b Hasso Spode, „Der Computer – eine Erfindung aus Kreuzberg, Methfesselstraße 10/Oranienstraße 6“, in: Geschichtslandschaft Berlin: Orte und Ereignisse: 5 vols., Helmut Engel, Stefi Jersch-Wenzel, Wilhelm Treue (eds. ), vol. 5: 'Kreuzberg', Berlin: Nicolai, 1994, pp. 418–429, p. 425. ISBN 3-87584-474-2. ^ Kathrin Chod, Herbert Schwenk and Hainer Weißpflug, Berliner Bezirkslexikon: Friedrichshain-Kreuzberg, Berlin: Haude & Spener / Edition Luisenstadt, 2003, p. 52. ISBN 3-7759-0474-3. ^ St. Amant, Kirk; Still, Brian. Handbook of research on open source software Idea Group. 2007. ISBN 978-1-59140-999-1. Retrieved March 14, 2010. ^ a b Hasso Spode, „Der Computer – eine Erfindung aus Kreuzberg, Methfesselstraße 10/Oranienstraße 6“, in: Geschichtslandschaft Berlin: Orte und Ereignisse: 5 vols., Helmut Engel, Stefi Jersch-Wenzel, Wilhelm Treue (eds. ), vol. 5: 'Kreuzberg', Berlin: Nicolai, 1994, pp. 418–429, p. 428. ISBN 3-87584-474-2. ^ Chronik, Bernd Selig, Kreuzberger. "Kreuzberger Chronik: Bomber Ã¼ber Kreuzberg - Sie lesen das Original! aus Berlin-Kreuzberg". www.kreuzberger-chronik.de. ^ "Mathematicians during the Third Reich and World War II", Technische Universität München. Retrieved March 14, 2010. ^ "Germany's Secret Weapons in World War II", Roger Ford. Zenith Imprint, 2000. ISBN 0-7603-0847-0, ISBN 978-0-7603-0847-9. Retrieved March 14, 2010. ^ "The S1 and S2 Computing Machines — Konrad Zuse´s Work for the German Military 1941–1945", Atypon Link. Retrieved March 14, 2010. ^ "get-it: Ursula Walk". www.get-it.tu-berlin.de. ^ Rojas, Raúl; Hashagen, Ulf (2002). The First Computers: History and Architectures. MIT Press. p. 292. ISBN 978-0262681377. Retrieved October 25, 2013. ^ Joachim Hohmann: Der Plankalkül im Vergleich mit algorithmischen Sprachen. Reihe Informatik und Operations Research, S. Toeche-Mittler Verlag, Darmstadt 1979, ISBN 3-87820-028-5. ^ a b "Graphomat Z64 (in German)". www.zuse.de. ^ "Automata and punched card machines: Helix tower". Deutsches Museum. Retrieved 13 February 2019. ^ Bock, T.; Eibisch, N. (2010). The helix tower by Konrad Zuse: Automated con- and deconstruction. 27th International Symposion on Automation and Robotics in Construction (ISARC). Bratislava. ^ Bruderer, Herbert. "Did Alan Turing interrogate Konrad Zuse in Göttingen in 1947?" (PDF). Retrieved 7 February 2013. ^ Jane Smiley (2010). The Man Who Invented the Computer: The Biography of John Atanasoff, Digital Pioneer. Random House Digital, Inc. ISBN 9780385527132. Like Alan Turing, Zuse was educated in a system that focused on a child's emotional and philosophical life as well as his intellectual life, and at the end of school, like Turing, Zuse found himself to be something of an outsider—to the disappointment of his very conventional parents, he no longer believed in God or religion. ^ Konrad Zuse (1993). The Computer, My Life. Springer. pp. 12–13. ISBN 978-3-540-56453-9. The only problem was that the progressive spirit at our school did not always correspond to my parents' ideas. This was particularly true for religious instruction, which now and again seemed even to us pupils to be rather too enlightened. After the 'Abitur' my parents wanted to go to communion with me; it was a terrible disappointment to them when I wouldn't go. They had lived under the illusion that I was a good student when it came to religion, too, which wasn't the case. ...I remember a poem presented by a student, which made a great impression on me. The essence of the poem read, "Basically, you are always alone". I have forgotten the name of the poet, but have often experienced the truth of these words in later life. ^ Rechnender Raum (PDF document), Elektronische Datenverarbeitung, 8: 336–344, 1967. ^ Zwernemann-Blech, Irene. "Zuse-Jahr 2010". www.horst-zuse.homepage.t-online.de. Rechnender Raum (PDF document), Elektronische Datenverarbeitung, 8: 336–344, 1967. Raul Rojas (Hrsg. ): Die Rechenmaschinen von Konrad Zuse. Springer, Berlin 1998, ISBN 3-540-63461-4. Wilhelm Füßl (Ed. ): 100 Jahre Konrad Zuse. Einblicke in den Nachlass, München 2010, ISBN 978-3-940396-14-3. Jürgen Alex: Wege und Irrwege des Konrad Zuse. In: Spektrum der Wissenschaft (dt. Ausgabe von Scientific American) 1/1997, ISSN 0170-2971. Hadwig Dorsch: Der erste Computer. Konrad Zuses Z1 – Berlin 1936. Beginn und Entwicklung einer technischen Revolution. Mit Beiträgen von Konrad Zuse und Otto Lührs. Museum für Verkehr und Technik, Berlin 1989. Clemens Kieser: „Ich bin zu faul zum Rechnen“ – Konrad Zuses Computer Z22 im Zentrum für Kunst und Medientechnologie Karlsruhe. In: Denkmalpflege in Baden-Württemberg, 4/34/2005, Esslingen am Neckar, S. 180–184, ISSN 0342-0027. Mario G. Losano (ed. ), Zuse. L'elaboratore nasce in Europa. Un secolo di calcolo automatico, Etas Libri, Milano 1975, pp. XVIII-184. Arno Peters: Was ist und wie verwirklicht sich Computer-Sozialismus: Gespräche mit Konrad Zuse. Verlag Neues Leben, Berlin 2000, ISBN 3-355-01510-5. Paul Janositz: Informatik und Konrad Zuse: Der Pionier des Computerbaus in Europa – Das verkannte Genie aus Adlershof. In: Der Tagesspiegel Nr. 19127, Berlin, 9. März 2006, Beilage Seite B3. Jürgen Alex: Zum Einfluß elementarer Sätze der mathematischen Logik bei Alfred Tarski auf die drei Computerkonzepte des Konrad Zuse. TU Chemnitz 2006. Jürgen Alex: Zur Entstehung des Computers – von Alfred Tarski zu Konrad Zuse. VDI-Verlag, Düsseldorf 2007, ISBN 978-3-18-150051-4, ISSN 0082-2361. O'Connor, John J.; Robertson, Edmund F., "Konrad Zuse", MacTutor History of Mathematics archive, University of St Andrews . Breadth-first search (BFS) is an algorithm for traversing or searching tree or graph data structures. It starts at the tree root (or some arbitrary node of a graph, sometimes referred to as a 'search key'), and explores all of the neighbor nodes at the present depth prior to moving on to the nodes at the next depth level. It uses the opposite strategy as depth-first search, which instead explores the highest-depth nodes first before being forced to backtrack and expand shallower nodes. BFS and its application in finding connected components of graphs were invented in 1945 by Konrad Zuse, in his (rejected) Ph.D. thesis on the Plankalkül programming language, but this was not published until 1972. It was reinvented in 1959 by Edward F. Moore, who used it to find the shortest path out of a maze, and later developed by C. Y. Lee into a wire routing algorithm (published 1961). Calculating Space (German: Rechnender Raum) is Konrad Zuse's 1969 book on digital physics. Zuse proposed that the universe is being computed by some sort of cellular automaton or other discrete computing machinery, challenging the long-held view that some physical laws are continuous by nature. He focused on cellular automata as a possible substrate of the computation, and pointed out (among other things) that the classical notions of entropy and its growth do not make sense in deterministically computed universes. Bell's theorem is sometimes thought to contradict Zuse's hypothesis, but it is not applicable to deterministic universes, as Bell himself pointed out. Similarly, while Heisenberg's uncertainty principle limits in a fundamental way what an observer can observe, when the observer is himself a part of the universe he is trying to observe, that principle does not rule out Zuse's hypothesis, which views any observer as a part of the hypothesized deterministic process. So far there is no unambiguous physical evidence against the possibility that "everything is just a computation," and a large amount has been written about digital physics since Zuse's book appeared. and computational complexity theory. In 1987, he received the Gottfried Wilhelm Leibniz Prize of the Deutsche Forschungsgemeinschaft, which is the highest honour awarded in German research. In 1999 he was awarded the Konrad Zuse Medal of the Gesellschaft für Informatik.Hotz received his PhD in 1958 at Göttingen. His advisor was Kurt Reidemeister. Horst Zuse (born November 17, 1945) is a German computer scientist. Hünfeld is a town in the district of Fulda, in Hesse, Germany. It is situated 16 km northeast of Fulda. In 2000, the town hosted the 40th Hessentag state festival. Hünfeld has a population close to 16,000. The Konrad Zuse Medal is the highest award of the Gesellschaft für Informatik (German Computer Science Society), given every two years to one or sometimes two leading German computer scientists. It is named after German computer pioneer Konrad Zuse. Note that a different medal with the same name is also given out by the Zentralverband des Deutschen Baugewerbes (Central Association of German Construction). Konrad Zuse Program is one-year fellowship for ICT entrepreneurs, supported from the Federal Foreign Office of Germany and the German Investment and Development Corporation (DEG). Konrad Zuse Program gives the opportunity to receive training in German companies operating in the area of Information & Communication Technology (ICT) in order to narrow the digital divide in a globalize world. Konrad-Zuse-Program included an academic component as well as internships in German companies active in the same sector as the prospective start-up. Plankalkül (German pronunciation: [ˈplaːnkalkyːl], "Plan Calculus") is a programming language designed for engineering purposes by Konrad Zuse between 1942 and 1945. It was the first high-level (non-von Neumann) programming language to be designed for a computer. "Kalkül" means formal system – the Hilbert-style deduction system is for example originally called "Hilbert-Kalkül", so Plankalkül means "formal system for planning". Volker Strassen (born April 29, 1936) is a German mathematician, a professor emeritus in the department of mathematics and statistics at the University of Konstanz.For important contributions to the analysis of algorithms he has received many awards, including the Cantor medal, the Konrad Zuse Medal, the Paris Kanellakis Award for work on randomized primality testing, the Knuth Prize for "seminal and influential contributions to the design and analysis of efficient algorithms." The Z11 was a computer, the first serially produced machine of the Zuse KG. Weighing 800 kg (1,800 lb), in 1955 it was built with relays and stepwise relays. Beginning in 1957 the Z11 could be programmed by punched tapes. It consumed 2 kW of electricity, and operated mechanically at a frequency of 10 to 20 Hz. Both input and output were in decimal numbers, and it used floating point arithmetic. The Z11 was first presented on the Hanover Messe in 1957. Today the German Museum of Technology and the Museum of Technology in Vienna exhibit one of the surviving Z11s. The Z1 was a mechanical computer designed by Konrad Zuse from 1936 to 1937 and built by him from 1936 to 1938. It was a binary electrically driven mechanical calculator with limited programmability, reading instructions from punched celluloid film. The Z1 was the first freely programmable computer in the world which used Boolean logic and binary floating-point numbers, however it was unreliable in operation. It was completed in 1938 and financed completely from private funds. This computer was destroyed in the bombardment of Berlin in December 1943, during World War II, together with all construction plans. The Z1 was the first in a series of computers that Zuse designed. Its original name was "V1" for VersuchsModell 1 (meaning Experimental Model 1). After WW2, it was renamed "Z1" to differentiate from the flying bombs designed by Robert Lusser. The Z2 and Z3 were follow-ups based on many of the same ideas as the Z1. The Z22 was the seventh computer model Konrad Zuse developed (the first six being the Z1, Z2, Z3, Z4, Z5 and Z11, respectively). One of the early commercial computers, the Z22's design was finished about 1955. The major version jump from Z11 to Z22 was due to the use of vacuum tubes, as opposed to the electromechanical systems used in earlier models. The first machines built were shipped to Berlin and Aachen. By the end of 1958 the ZMMD-group had built a working ALGOL 58 compiler for the Z22 computer. ZMMD was an abbreviation for Zürich (where Rutishauser worked), München (workplace of Bauer and Samelson), Mainz (location of the Z22 computer), Darmstadt (workplace of Bottenbruch). In 1961, the Z22 was followed by a logically very similar transistorized version, the Z23. Already in 1954 Zuse had come to an agreement with Heinz Zemanek that his Zuse KG would finance the work of Rudolf Bodo, who helped Zemanek build the early European transistorized computer Mailüfterl, and that after that project Bodo should work for the Zuse KG—there he helped build the transistorized Z23. Furthermore, all circuit diagrams of the Z22 were supplied to Bodo and Zemanek. The University of Applied Sciences, Karlsruhe still has an operational Z22 which is on permanent loan at the ZKM in Karlsruhe. Altogether 55 Z22 computers were produced.In the 1970s, clones of the Z22 using TTL were built by the company Thiemicke Computer. The Zuse Z23 was a transistorized computer first delivered in 1961, designed by the Zuse KG company . A total of 98 units were sold to commercial and academic customers up till 1967. It had a 40 bit word length and used an 8192 word drum memory as main storage, with 256 words of rapid-access ferrite memory. It operated on fixed and floating point binary numbers. Fixed-point addition took 0.3 milliseconds, a fixed point multiplication took 10.3 milliseconds. It was similar in internal design to the earlier vacuum tube Z22. Related variants were the Z25 and Z26 models.The Z23 used about 2700 transistors and 7700 diodes. The memory was magnetic-core memory. The Z23 had an Algol 60 compiler. It had a basic clock speed of 150 kHz and consumed about 4000 watts of electric power. An improved version Z23V was released in 1965, with expanded memory and higher processing speed. The Z23 weighed about 1,000 kilograms (1.0 t; 1.1 short tons). The Zuse Z25 was a program-controlled electronic computer using transistors developed by Zuse KG in Bad Hersfeld and put into production in 1963. The word length was 18 bits, though it could also process double-word lengths for accuracy up to 10 decimal digits. The addressable space was 32768 words. The maximum size of the magnetic core memory was 16383 words. The programmable program memory had a maximum size of 4096 words.For mass storage there was a drum memory available as well as a magnetic tape memory. The magnetic drum had a storage capacity of 17664 Z25 words. The transmission speed was 6900 words per second. The magnetic tape memory had a capacity of 1 million Z25 words and a transmission speed of approximately 33000 Z25 words per second. In- and output was through punched tape and punched cards; it was also possible to print to a teleprinter. The computer could carry out approximately 7100 arithmetic operations per second at a clock rate of 180 kHz. Several Z25s could be connected in a network. The Z25 could be used for the control and data acquisition of external devices through a program-interrupt system with up to 32 channels. The Z2 was a mechanical and relay computer completed by Konrad Zuse in 1940. It was an improvement on the Z1, using the same mechanical memory but replacing the arithmetic and control logic with electrical relay circuits. Photographs and plans for the Z2 were destroyed by the Allied bombing during World War II. In contrast to the Z1, the Z2 used 16-bit fixed-point arithmetic instead of 22-bit floating point. Zuse presented the Z2 in 1940 to members of the DVL (today DLR) and it was especially its member Prof. Alfred Teichmann, whose support achieved the partial funding of the successor model Z3. The Z3 was a German electromechanical computer designed by Konrad Zuse. It was the world's first working programmable, fully automatic digital computer. The Z3 was built with 2,600 relays, implementing a 22-bit word length that operated at a clock frequency of about 4–5 Hz. Program code was stored on punched film. Initial values were entered manually.The Z3 was completed in Berlin in 1941 but it wasn't considered vital, so it was never put into everyday operation. Based on the work of Hans Georg Küssner (cf. Küssner effect) e.g. a "Program to Compute a Complex Matrix" was written and used to solve wing flutter problems. Zuse asked the German government for funding to replace the relays with fully electronic switches, but funding was denied during World War II since such development was deemed "not war-important". The original Z3 was destroyed on 21 December 1943 during an Allied bombardment of Berlin. The Z3 was originally called V3 (Versuchsmodell 3 or Experimental Model 3) but was renamed to not be confused with Germany's V-weapons. A fully functioning replica was built in 1961 by Zuse's company, Zuse KG, and is on permanent display at Deutsches Museum in Munich.The Z3 was demonstrated in 1998 to be, in principle, Turing-complete. However, because it lacked conditional branching, the Z3 only meets this definition by speculatively computing all possible outcomes of a calculation. The Z4 was the world's first commercial digital computer, designed by German engineer Konrad Zuse and built by his company Zuse Apparatebau in 1945. The Z4 was Zuse's final target for the Z3 design, but like Z2 it was partly mechanical (memory) and electromechanical machine. The Z5 was a computer designed by Konrad Zuse and manufactured by Zuse KG following an order by Leitz GMBH in Wetzlar AG in 1950. The computer was delivered in July 1953 and was the first commercial built-to-order mainframe in Germany. The computer was purchased to help with the design of optical lens systems. The Z5 is the successor of the Z4, and is much more compact and powerful. Zuse implemented the machine with relays, since vacuum tubes were too unreliable at the time. The Z5 used the same principles as the Z4, but was six times faster. It also had punched tape readers, which the Z4 did not have. It had conditional branching and five subroutine loops. The Zuse Institute Berlin (abbreviated ZIB, or Konrad-Zuse-Zentrum für Informationstechnik Berlin) is a research institute for applied mathematics and computer science on the campus of Freie Universität Berlin in Dahlem. The ZIB was founded by law as a statutory establishment and as a non-university research institute of the State of Berlin in 1984. In close interdisciplinary cooperation with the Berlin universities and scientific institutions Zuse Institute implements research and development in the field of information technology with a particular focus on application-oriented algorithmic Mathematics and practical Computer science. ZIB also provides high-performance computer capacity as an accompanying service as part of the Network of high performance computers in Northern Germany (Norddeutscher Verbund von Hoch- und Höchstleistungsrechnern (HLRN)). Konrad Zuse, born in Berlin in 1910, is the namesake of the ZIB.